When Gila Sibony was six months pregnant, she suffered a life-threatening bleed in her brain. The Hadassah Medical Center’s specialists saved her life, but she lost the baby. Fast forward about five years and Gila is the mother of a new baby girl, born at Hadassah. “We owe my wife’s life and our baby’s life to the amazing staff in Hadassah’s two hospitals and all the supporters around the world who have made such advanced medicine possible,” relates Gila’s husband, Yoni. Gila recalls how everything was going along smoothly with her first pregnancy until, suddenly, she experienced a severe headache and collapsed on her bed. She managed to roll herself over to the phone to call for help. During surgery, Dr. Rosenthal and his team removed the top of Gila’s skull to relieve the swelling and remove the huge blood clot. It had been caused by a brain arteriovenous malformation (AVM), which is characterized by an abnormal connection between the arteries and veins. The problem is congenital, but before this, Gila had not experienced any symptoms. Her pregnancy, however, put pressure on her system and caused the rupture. Slowly, the swelling went down. Several weeks later, Gila began to wake up. “Recovery is a very slow process, but we were hopeful,” Dr. Rosenthal says. Eventually, Gila was well enough to begin a comprehensive rehabilitation program at Hadassah Hospital Mount Scopus. “We gathered a multidisciplinary team of doctors, nurses, speech therapists, occupational therapists, physical therapists, psychologists, and dieticians to help her,” reports Dr. Isabella Schwartz, head of Physical Medicine and Rehabilitation. Like a dangerous roadway, the affected part of her brain needed to be closed off. Neurosurgeon Prof. Jose Cohen inserted soft platinum coils, shaped like springs the size of a human hair, and neutralized the problem. Every stage was monitored at Hadassah. 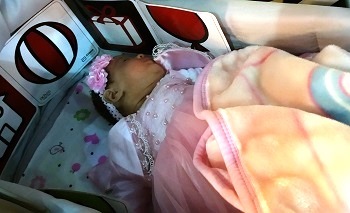 About a month ago, Gila gave birth to her daughter and she and Yoni named the baby Oreen, signifying light and joy.